Beasley&apos;s Orchard, which is most known for its fall offerings, will reopen for the season in about two weeks. When it does, visitors familiar with this Danville landmark will notice a big change to its Civil War-era barn. 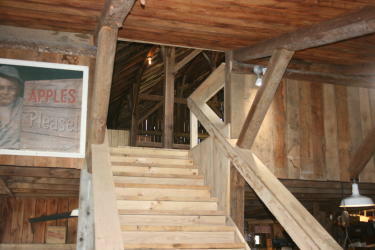 The Beasley family decided to open up the loft area of the barn that has always been there but mostly used for storage and unavailable to the public by constructing an expansive stairway made of Indiana-grown hardwoods as you walk into the barn&apos;s main entrance. Our Visit Hendricks County staff got a sneak peek of the changes recently, and we came away quite impressed with what has been done over the winter. The new area called the Hayloft at Beasley&apos;s Orchard opens up another 1,400-square-feet of space that the family envisions using for parties, second weddings, family reunions, receptions, corporate retreats and any other public uses for 65 people or less. The space also likely will be used during the orchard&apos;s busy season and big events as overflow retail space. The extra wide staircase leading up to the loft did cost their business some space downstairs and will change the flow slightly, but the family thinks the added square footage and multiple uses will more than make up for it. As I strolled up the stairs for the first time, I found myself awestruck by the new aerial view down to the apple production area as well as a new rustic chandelier made from an old hay hook that the Beasleys found while cleaning out the loft. They also brought in more native Indiana wood to build a new floor and cut out three new windows to add natural light into the space. With a kitchen downstairs, the Hayloft adds another great event space to Hendricks County&apos;s ever-growing options. The new space also adds to the changes that began happening at Beasley&apos;s last summer when they added their new Barnyard Bonanza that includes a ball zone, giant inflatable pillow and other activities for the entire family. 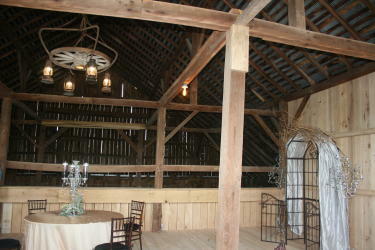 So make sure to check out the new Hayloft the next time you visit Beasley&apos;s Orchard. The orchard reopens June 24, and Calvin Beasley said this year&apos;s apples should be a bumper crop along with all the other fun activities and great shopping that is available out there.